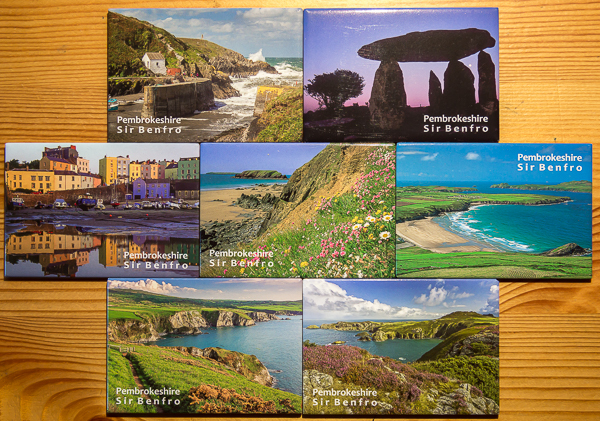 For the last six weeks I’ve been working hard getting my Wild Wales postcards out into shops all over Wales. When I started publishing postcards in 1987 the idea that everyone would have a mobile phone (with integral camera) in their pocket was unthinkable. Mark Zuckerberg (Facebook’s inventor) was just three years old. I certainly wouldn’t be starting out with a range of postcards in the current climate but I’m still reasonably happy with the way things are working out. While all of my other costs have risen during that time the price of printing has actually fallen considerably. The unit cost of my last batch of cards was actually about half of what I had been paying at one time! So for the time being the postcards are still viable. Just about every single other income stream I have developed over the course of my career has either declined gradually or come to a complete dead end. A friend told me I should be doing fridge magnets, but I dismissed them as being “tat”- and I don’t do tat. But he persuaded me to visit a friend of his, a Scottish photographer named Ian Mills who, as well as publishing postcards, is making a reasonable income from fridge magnets in his part of the world. Ian has his manufactured in China and he very kindly offered to let me add my requirements to his the next time he ordered. This had the effect of cutting my unit costs by more than 50%. Fortunately Ian is a stickler for colour accuracy so I feel I am in good hands with him as a go between. A small batch of magnets was air-mailed over recently and the quality is very good. I’ve been able to show samples to some of my customers and many seem willing to give them a try. It is touch and go whether the rest of the order will arrive in time for Easter, however. I suspect by that time they may be somewhere halfway across the Indian Ocean. But other than that I think I’ve changed my mind about fridge magnets. 4 Responses to On a slow boat from China. Good luck with the new line, they look good from here! Thanks. Nice of you to take the time to comment. I’ve more or less finished the postcard selling for a while so hope to get back in to photography mode soon! Incidentally I “followed” your blog a while back but haven’t had any posts. Any idea why that might be? Spring is the best time to refocus if you pardon the pun. No idea why posts aren’t showing, do you normally get notification emails? I’ll check things out at this end.